Sarah Appleton presents her research in Glacier Bay National Park and Preserve. 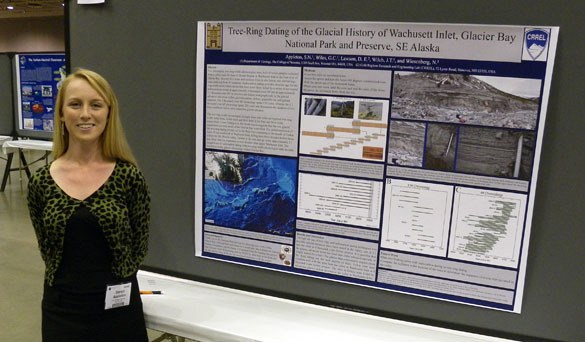 Her IS topic Tree-Ring Dating of the Glacial History of Wachusett Inlet, Glacier Bay was part of a special session honoring Dr. David Michaelson (U. Wisconsin – Madison) a long time worker in Glacier Bay. Andrew Collins presents his work on The Use of Geophotography as a Permanent Resource in Higher Education – this is a collaborative project that Andrew is doing with Drs. Judge and Wiles and The College of Wooster librarians – Marsha Bansberg and Jessica Clemons. The database has gone live and can be found here. In the future all those trips to Spangler and other field sites around Wooster will be archived at this site. If alumni have some photos in their collection they would like to contribute to the effort, that would be greatly appreciated. 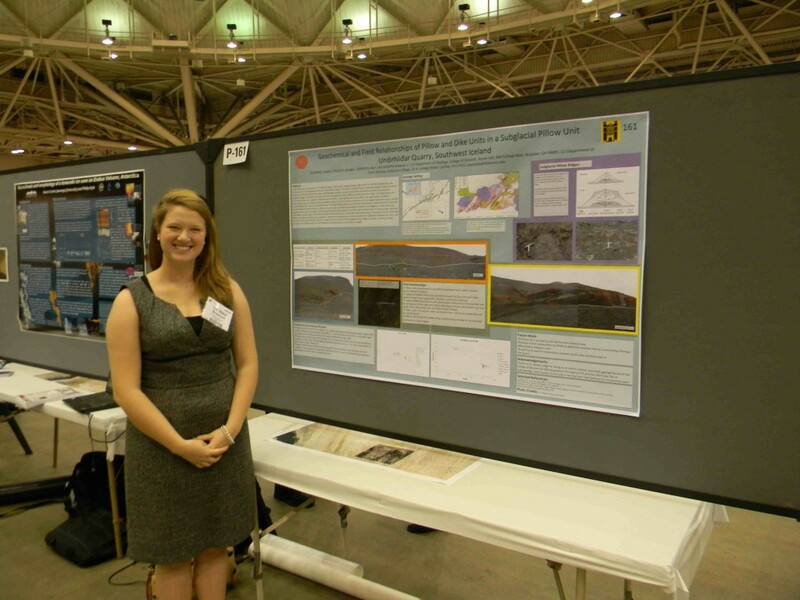 Lindsey Bowman presented her geochemical data to the geologists. 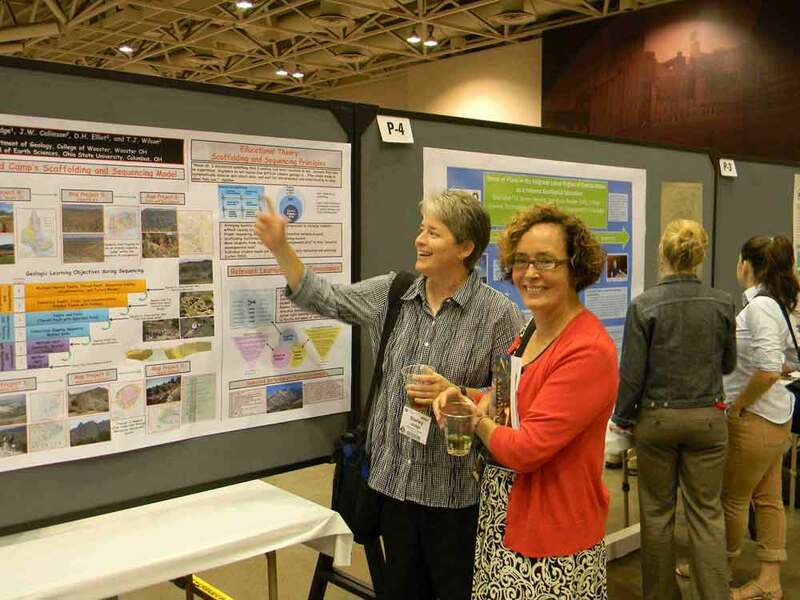 He poster describes results of her ongoing IS work with Dr. Meagen Pollock in Iceland. Her poster is entitled: Geochemical and Field Relationships of Pillow and Dike Units in a Subglacial Pillow Ridge, Undirhlithar, Southwest Iceland. Dr. Shelley Judge leads a lively discussion of her work summarizing 65 Years of Pedagogical Scaffolding and Sequencing in the Sanpete Valley of Central Utah – although it sounds like a series of structural geology terms, Dr. Judge’s poster was about assessment. 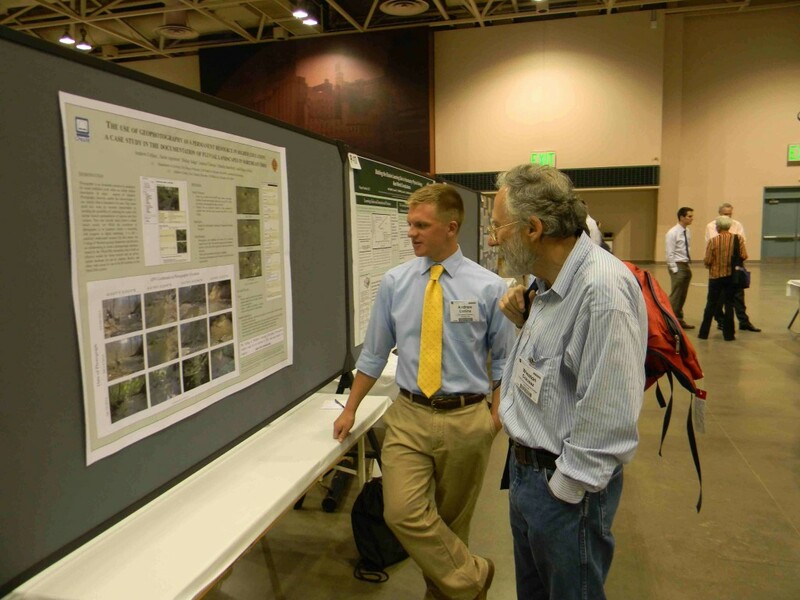 In addition to being a leader in the field of structural geology, Dr. Judge is a leader in learning assessment, which makes her Chair very happy.